City Attorney Dennis Herrera has just filed suit in San Francisco Superior Court against Ashok Gujral, a local real estate developer and investor accused of routinely engaging in under-permitted construction on residential properties throughout San Francisco. Between June 2015 and September 2016, Gujral purchased seven residential properties in San Francisco. Shortly after purchase, Gujral followed a similar approach with each. First, he would seek permits for what he claimed would be simple construction, like interior remodeling or removing plumbing and electrical fixtures. The permits were issued quickly without additional review by other City departments. Gujral would then do major renovations at each property that went well beyond what was represented in the permit applications. By doing this, Gujral evaded proper City oversight and applicable permit fees while unlawfully bulking up homes to apparently flip them for a higher profit. 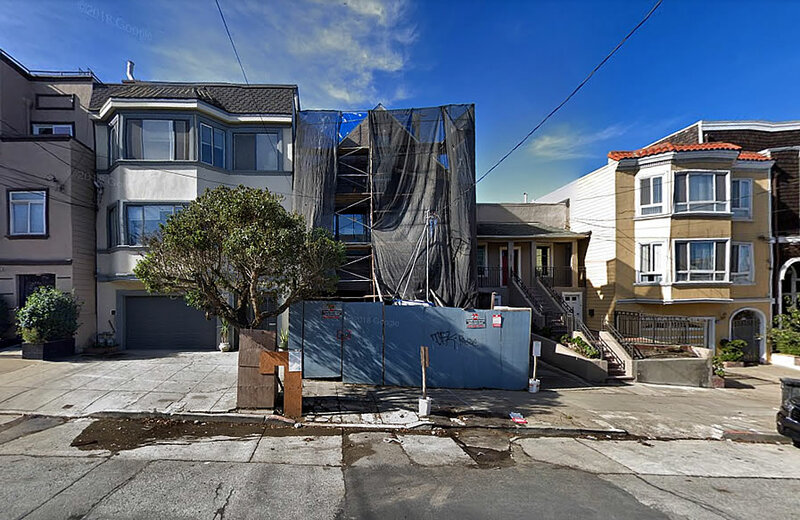 While Gujral had obtained permits for an “interior” remodel of the Noe Valley home at 1613 Church Street, the resultant work included both vertical and horizontal additions, not to mention a new roof deck. Over in Bernal Heights, Gujral converted a two-unit building at 120 Brewster into a single-family home without a required dwelling unit merger (DUM) and expanded the envelope behind a new facade at 4068 Folsom Street, including the addition of a new rear deck and patio, without the benefit of any permits. 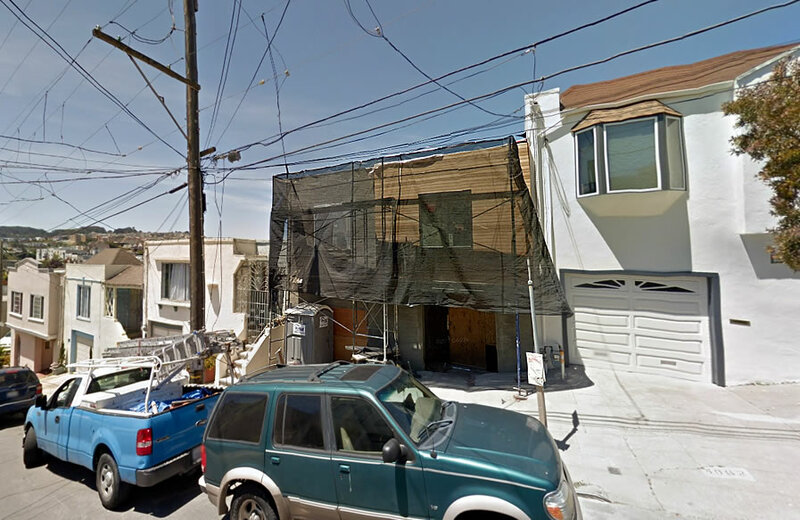 Under-permitted work on Bernal Heights homes at 437 Ellsworth and 310 Montcalm is outlined in the complaint as well. Over in Dogpatch, Gujral removed the historic façade of 903 Minnesota Street sans approval. 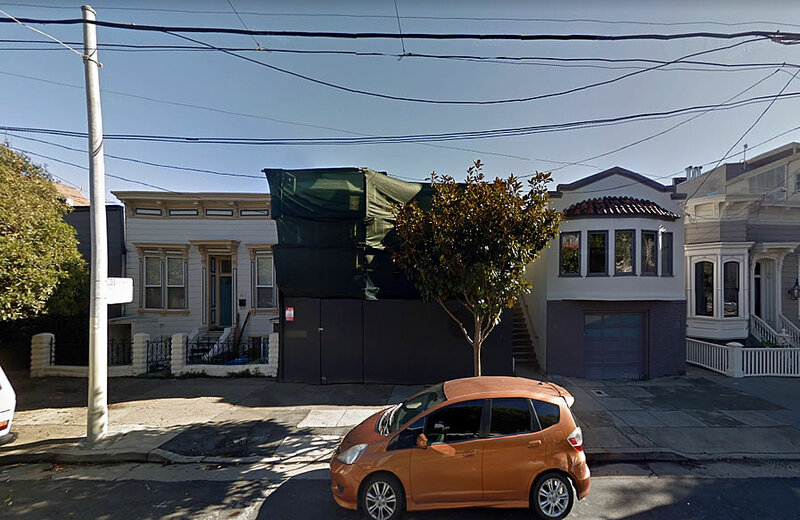 And the facade of 531 33rd Avenue in the Outer Richmond was removed, and a top floor deck enlarged, sans approval as well. 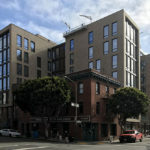 And in addition to seeking court oversight to ensure that all the aforementioned properties are brought into compliance with San Francisco’s building and planning codes, the City is seeking civil penalties of up to $2,500 for each act of unfair and unlawful business competition; daily penalties of up to $500 for each violation of the San Francisco Building Code; and daily penalties of at least $200 for each violation of the San Francisco Planning Code committed at each of the properties. I mean, of course he could do that for $73K, right? Very ironic indeed. Prominent tenants right attorney. Seven properties – this guys sounds prolific. But the penalties are pretty insignificant and unlikely to act as a true deterrent. The only one that could make a dent is the $200 daily penalties. You can’t do the math without the details, but daily penalties of $500 per violation could actually add up to an enormous fine. cleverpunhere, that is assuming that there are much in the way of building code violations. If this developer did the work up to code (albeit without proper permits), then the $500/day/violation won’t apply. Now if the work isn’t up to code or The City requires the work be undone… then he’s hosed. I’m having a hard time reconciling “We’re seeking a steep penalty to ensure that cheating the system…” with “the City is seeking civil penalties of up to $2,500 for each act of unfair and unlawful business competition; daily penalties of up to $500 for each violation of the San Francisco Building Code; and daily penalties of at least $200 for each violation of the San Francisco Planning Code committed at each of the properties.” If Mr. Gujral flipped most of his properties, the profit he made from his bad behavior is significantly greater than the fine. Not much of a deterrent. 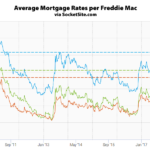 I think a deterrent may be in the form of the caution of potential buyers who may be unwilling to take on a legal mess when buying his homes. I hope The City goes after more of these sleazy crooks. They know exactly what they’re doing and hope they don’t get caught. Agree 100%. If we’re going to have rules, everyone should follow them. At 310 Montcalm, he added an entire third floor to the property without a permit. Adding a floor should have triggered a structural engineering review. Maybe the developer did proper engineering work. Maybe not. The future owners of the house deserve to know. There was no structural review of the unpermitted third floor. There were no plans for the third floor. It just got built and then, the city stopped all work on the project. Kind of hard to add a third floor that’s not part of any permitted plans and have it go unnoticed. It is still there today. Drive by and have a look. It’s brazen and shocking. The permits don’t read that way, they had engineering review. The third floor was never part of any plans filed with the city. It was built off permit, with no architectural or engineering plans whatsoever. The city told the developer to remove it. He ignored them. It is still there today. I’m assuming there are stop work notices and requirements for lawful permits and penalty enhancements on the permits once issued after the fact. The time delay alone could sink this guy. It could get very expensive while up to 7 properties languish for …2-3 years. Hilarious. 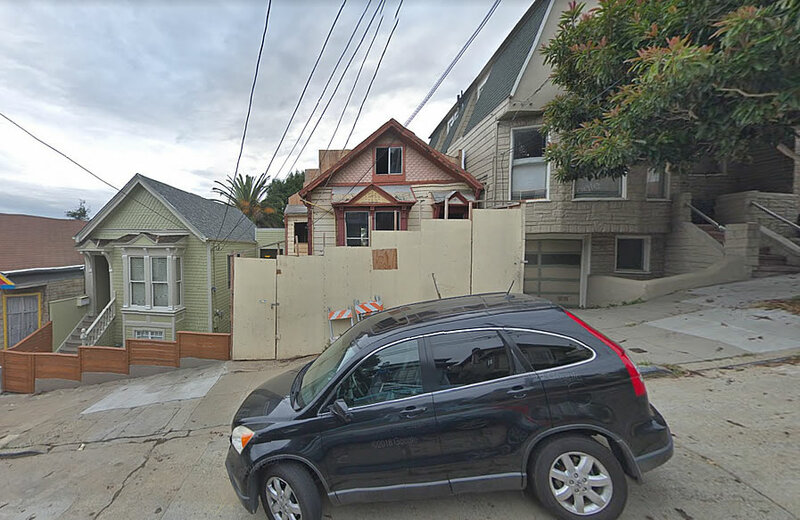 Only in SF do people get sued for turning s***hole properties into nice homes. This is one backwards city. How do you know that these remods are an improvement? Maybe the developer did proper work. Who would know? I’ve got no problem with doing work without permits so long as the scope is small (I’m in the middle of such a project right now), but the scope of these projects is huge and there’s plenty of opportunity for mistakes (or corners intentionally cut) to accumulate into an unsafe dwelling. Oh that’s a real good line. “so long as the scope is small”? So, now you’re the judge of what is and is not small in scope. I guess it shows how little respect you have for building codes that are meant for EVERYONE. I’ve got a big problem with your thinking. On this one, Futurist is obviously correct. The problem with “so long as the scope is small” as a criterion is that greedy, ignorant flippers can convince themselves that any project they undertake is “small” once the motivation for their reasoning is maximizing profit. When I was a lot younger I short-term leased a blatantly illegal “granny unit” from a bootleg landlord/homeowner who did the work (basically, throwing up drywall on the then-exposed studs of an existing garage) himself. Well into the lease term, I had the temerity to ask if he got a permit for the conversion, because the visible electrical work (the power outlet installation) was obviously not up to code. He told me without a pause that he looked into it at the time and the permit would have cost more than the materials, so that was justification enough for him to proceed without one. I’ve since met a lot of these kinds of people, and I would be willing to bet that Mr. Gujral had justified each of these projects to himself as not needing the proper permit. Why? Because it would cost too much, and he needed to make (more) money. Same goes for not intentionally cutting corners that result in an unsafe building. Who is to decide what results in an unsafe condition? A neutral third party or the owner who is out to make as much money as possible and is willing to let the end justify the means? A greedy owner will just assert that the finished project is “safe” because they say so, and hey, they needed to make money so building code be damned. Thanks for your thoughts and support of my comment. People who just feel they don’t really need a permit because the “scope is small” are probably the same people who feel they don’t need to really stop at a stop light, or pay taxes, or park in a handicapped spot (it’s only for a minute), or don’t need to bother with car insurance, or maybe not bother to pay for that little thing I wanted in the store. (it’s not a big deal, the store makes huge profits). That’s the type. They lack any kind of integrity or moral compass. Interesting. If you don’t follow the law, you lack integrity or moral compass. I’m willing to bet many here on occasion have gone over the speed limit. I suppose you would have been on the side of Prohibition, or today perhaps enforcing laws with zero tolerance? Somehow I doubt that. Why? because not all laws are just. Hypothetical question, what if this developer warrants and guarantees this property to perform as advertised? You can inspect it all you want and find that all work meets or exceeds industry standards (building codes?). I’m not arguing that this is what happened. Just questioning why you need the government to “certify” that something was built “properly”, like the Millennium Tower. Guys, I doubt we will ever agree on this issue. I can assure that my current project is small. All I’m doing is squaring off some plastered arches and casing them with traditional wood trim. No structural or systems work. I work M-F all day and getting permits for for a small job adds excessive cost as I’d have to take at least a day off work. For big jobs I prefer to pull permits. My last remod required about $3-4000 in permits and I was glad to cover that cost. Even so hiring professional builders to be checked by professional inspectors isn’t a guarantee of safe construction. I found and fixed several problems created by that last big remod. There were about five electrical problems alone, most of them code violations. The most egregious was an unterminated hot wire list left snipped off in the attic. While I agree that the existing permit/inspection requirements are generally a good idea, what really creates safe and sound construction is competence and the willingness to build things right. Not all builders have both and inspectors are just spot checking. It’s not really even about agreeing. It’s really about some people including you, who feel it’s ok to cheat; because, of course you’ve determined that your project is “small”, and therefore you don’t need to get a permit. And it’s also about others, like myself who believe it’s unethical to cheat. Why don’t you give us your address so we can build a 10 story slaughterhouse/sewage plant next door. I’m sure you wont mind if we don’t get permits as long as it looks nice. As long as the construction is within the zoning and building code limits I think homeowners should be able to remodel their property however they want. A 10 story sewage plant would be illegal in a residential area. Right but the issue here is the oversight to determine if this guy’s projects are within the building code limits. Are you suggesting we should just rely on the honesty and competency of the developers to comply without any inspections or prior permits? You’ve just said that the homeowner is following ALL of the building and zoning codes, right? And if they are remodeling the way they want, then there is compliance and no problem. Trouble is most homeowners are complete amateurs at building and remodeling. They can make choices that can affect the safety and structural integrity of a building without knowing it. The developer did not get sued for turning sh*thole properties into nice homes. He got sued for not getting the proper permits. Are you suggesting that if a property is not a sh*thole that only that homeowner should get the proper permits? The Complaint is worth a read just to get a feel for the brazen scope of his actions. The City is asking for injunctive relief to have a receiver appointed, have the properties restored and put in conformity with the various codes and to preclude him from renting or selling or profiting from them until everything is kosher. Also asking for attorneys fees and costs per code. Does anyone use their real names on this site? I don’t read the ones from aliases. how do we know that is your real name? I completely agree that there should be consequences for flouting the law and regulations and permitting are necessary. However, how much of the current system of required permitting/regulations that are being “gamed” in this case is contributing to San Francisco having the most expensive housing in the nation? If neighbors (or political activists) oppose your project, well, you can see what happened to the gentleman in the Mission. Mob rule. I say you should be able to build your own property however you want as long as its dimensions are within the building codes. Where were the inspectors? When I did some interior remodelling at my home, the inspectors were all over it, even requiring me to replace a 20-minute rated door with a 60-minute door in a 100 year old stairway that wasn’t even rated, itself. Don’t even get me started on the electrical inspector. Electrical inspectors are the worst! When I did a bathroom remodel, the contractor pulled electrical, plumbing and building permits. At the final inspection when I met the electrical inspector at the door he asked “are you the electrician who did the work?” When I told him I was the property owner, he left, saying he couldn’t conduct an inspection without the person who did the work there in case he needed to ask questions. I told my contractor, and he said that he had never heard of that requirement. To make matters worse, the company had subcontracted the electrical to a third party who was not in the area. It took a week or more of negotiations until Department of Building Inspection would consent to having the contractor there instead of the electrician. Fortunately, they sent a different inspector who was much nicer. Why hate on this guy? He’s trying to make these properties into something, while doing it on a budget. I can’t blame him for trying to skirt SF permits. Have ANY of you tried pulling permits with San Francisco? [They] give you the run around, and after you talk with about 30 people, you go back to the original guy who then changes his mind, who later may change his mind again. SF needs to get their act together. Totally agree. There is zero customer service at Planning, Building, DPW. You are literally paying them to review your plans. Then they frequently go dark for weeks or months, and when they finally deign to speak to you, the information is often conflicting or incoherent, and the attitude is that they are doing YOU a favor. Planners in particular have such wide discretion that you must walk on eggshells and obsequiously beseech them to do their job. Or you can pay an “expediter,” just another palm to be greased, whom you engage to beseech the employees of the city to do their damned jobs… it’s Kafka-esque and embarrassing. Guess you’ve never had a charming little Edwardian on your block obliterated and turned into a crap Richmond Special? Many of us have had this happen too many times to count over the decades. So he stands to pay like $10K in fines for half a dozen multimillion dollar properties? Some justice. It’s heartening that the City is going after stuff like this. It’s depressing that it’s three years after the first obvious violations. The City that knows how… Ah, irony. Mel Murphy. Famous for exactly this – not pulling proper permits. Served on the Building Inspection Commission from 2006 to 2012. Only got prosecuted when he slid a whole house down a hill into the neighbors. Gotta wonder who Ashok Gujral pissed off in order for the City to actually take action. Maybe if the cost of the permits actually paid for someone’s time to come out and inspect the property to ensure proper construction practices are up to code, then these rules would actually apply to everyone. As it is, you pay an extortion fee, the eventual home owner gets no guarantee of quality, and you’ll be lucky to get inspectors who are actually critical of the work. Doesn’t happen here. Especially in high-rise condos. That’s why people suffer from things like no unit-level shut-off valves, poor water pressure, etc. It’s a disgrace in a city w/ such high housing prices and ridiculously expensive permits. I think the problem is on both ends. The process is way too easy for NIMBY’s to object to every single reasonable building permit. Two buildings on my block were brought to discretionary review because a few neighbors who had illegal windows on their lot lines wanted to complain about light and privacy issues created by the legally allowed and very well designed new buildings. The NIMBY’s stopped both projects for two years only to eventually and rightly loose their objections. Similarly I would hope that those who blatantly skirt permitting law are held accountable. Right now, however, I feel the entire permit process favors those NIMBY’s who just don’t want to see change…hence you get these situations. If the system were more balanced, if NIMBY’s who object when they have no real legit claim (e.g. plan is ultimately approved) have to pay serious fines to the winning homeowner (so you only object if you have a real legit complaint), and if planning were forced to be more consistent with its decisions and transparent, I would bet you would see much more voluntary compliance with permitting.